The one we went to was located in the Jungceylon Mall in Phuket, near the Bangla Road. We were trying to find a place to eat lunch, and finally settled on this restaurant after debating over numerous restaurants that was also located in the mall. Since I am in Thailand, I thought I ought to order the Pad Thai. I am a big fan of Pad Thai, but haven’t had it in a while since I started cutting down on the carbs. But..I am on vacation so this doesn’t count. 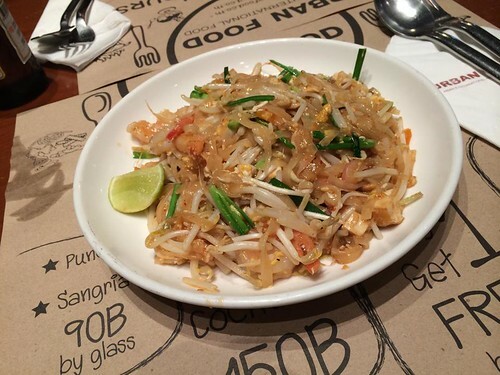 The pad thai was okay…….. I think it could use a little bit more spice. I did request the pad thai to be spicy, so was disappointed as to how mild the dish was. I think if I come back to this mall again, I probably would try something different (i.e. the irish pub because I am in love with Guiness). We did meet a nice couple from Australia, claiming they have visited Phuket about 10 times. They gave us some good tips on where to go in Phuket, what are must do’s and generally how to get around. Love Aussies, they are so nice!! Nothing more to add here! ‹ LA CASA MI CASA!